Is your son or daughter destroying their lives with drugs or alcohol? Do you find yourself watching by helplessly as they continue to make bad choices that are ruining their lives (and yours) ... despite your best attempts to intervene and get them to change their ways? Whether your child is 14, 24 or 40 ... living at home with you or has family and kids of their own ... getting into regular trouble with the law or running amok at college ... you as their parent never stop worrying about their well-being and continue to wonder what you can do to help them with their drug or alcohol problem. Being parent to a child who has an addiction to drugs or alcohol is one of the most painful things to have to deal with. You question yourself and your ability as a parent. You never stop agonising as to what else you can do to save your child. And your biggest fear of all is that one day you may get that dreaded phone call telling you your child is dead. Children who drink in their early teens are more likely to develop a problem than those who wait until they're 21. Being a parent today is hard. Quite possibly more so than ever before. The world sometimes feels like it’s coming apart at the seams. Economies are in real trouble, jobs are scarce, the war on terror, modern obsession with instant fame and fortune, the need to fit in, and a general decline in core values (like discipline and respect) – are some of the issues not only we are exposed to, but our children as well. Let’s face it – it’s hard enough for us to navigate our own lives through all this ... so how on earth do we do it for our children as well? Look, alcoholism and drug addiction aren’t new maladies. They’ve been a part of society for thousands of years. But modern society with the stresses it brings and the problems we face today (like those referred to above ) make it fertile breeding ground for us to want an escape - and what ‘easier’ way is there than to turn to alcohol or drugs for comfort. And that’s how our kids get hooked. You can be the best parent in the world and it could still happen to you. Addiction isn’t selective in whom it chooses. It crosses all social, cultural and economic divides. So this isn’t about analyzing the whys or blaming yourself. It’s about finding solutions. You’re reading this because alcohol or drugs have stolen your child. Now is the time to find out how you can set them free. I certainly didn't expect that to be the case, and it made me realise that there is very little information out there specifically designed to help loved one's and family members of alcoholics and drug addicts (even more so parents) deal with the situation they find themselves in. And I think due to the fact that we've started catering for this need and trying to help parents like you better understand and cope with the challenge of having a son or daughter struggle with an alcohol or drug problem, that we've grown so rapidly and now reach so many people all over the world. But I do think through the experience I've gained in helping and advising hundreds of other parents like you as to what they can do to help their children and better deal with the challenges they're faced with - you stand the best possible chance of helping your addicted son or daughter. Drug abuse and drug addiction cost Americans nearly $500 billion annually. 3 in 10 people drink at levels that put them at risk of developing alcoholism, liver disease and other related problems. Are You Serious About Saving Your Child? There are some crucial things you need to know if you're ever going to be able to help your child. Because understand this, nothing will change if you don't change and start to do things differently. Your inclination as a parent is to want to protect your child from harm, but the way you go about doing that often keep your addicted son or daughter stuck in the cycle of their alcoholism or drug addiction even longer. Facing up to the question most parents in your position don't want to face up to: What to do about your alcohol or drug abusing son or daughter living at home ... or has asked to move back home. Do you kick them out? Let them move back in? All is revealed in Chapter 13. A sample of case studies that deal with just about any issue you as a parent could possibly face when dealing with addiction in your child - not matter how old they are. These are real life examples from which you can learn a huge amount. (Pages 95-109). The above points are just a sample of what you'll discover when you Get Your Hands On "Help!My Child Is An Addict" so the knowledge it contains could make a world of difference to you. Look, like I said a while ago, there isn't a lot of knowledge out there that deals specifically with parents like you who have a son or daughter (no matter what their age) struggling with alcoholism or drug addiction. That's why if you're looking for the specialised knowledge a parent in your position needs, you've come to the right place. Now stay with me and listen closely ... What price would you put on discovering the most effective ways to help your addicted son or daughter? That's right - there isn't a price you can really put on it is there? You're talking about your child's life here. Rehabs, counseling, doctors ... providing them with financial support when they've been broke or unemployed ... looking after your granchildren because they haven't been able to ... having to pay any number of legal or related fees because your child has gotten in trouble with the law ... and not forgetting the cost of everything they've stolen off you to feed their habit ... I mean imagine putting a price on all that? So don't worry this information isn't going to cost you thousands of dollars. I want this to be affordable so that you have no excuse not to buy the book, and can begin reading and taking action within minutes. That's why you can Own a copy of "Help! My Child Is An Addict" for only $19.99. And let's be honest $19.99 doesn't get you a lot today. You couldn't even catch a movie and buy a bag of popcorn for that price today. But what I'm sharing with you is infinitely more valuable than that. Now to make your decision even easier and to encourage you to act immediately ... I'm prepared to offer you two e-mail coaching consultations whereby I personally advise you on how to deal with your addicted child and answer any specific questions you may have ... absolutely free. But if you act right now, I'll make sure I make time available to help you get started on the journey towards healing ... and advise you personally how best to deal with your son or daughter's alcohol or substance abuse problem in the form of personal coaching. Read "Help! My Child Is An Addict entirely at my risk for the next 60 days - and if hasn't been what you expected or hasn't produced the results you'd hoped for, I'll happily refund your money, no questions asked. I don't know of many books you can buy that offer that kind of guarantee. 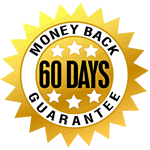 So there is really no way you can lose on this with a 60-day, 100% guarantee like that. I just really want you to read the book, because I really do believe it contains life-changing information that can help you and your child. I understand that by taking advantage of this offer right now, I will receive my copy of "Help! My Child Is An Addict" in eBook format and I will also receive all of the bonuses mentioned above for ONLY $19.99. I'm not sure there is anything more I can tell you. I've done everything I can to make this decision as easy and pain-free as possible for you. I really believe "Help! 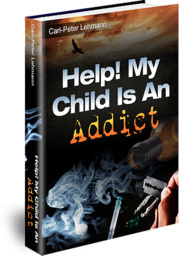 My Child Is An Addict" contains information that can help you, help your child. But as I like to remind people, knowledge in itself isn't power. Knowledge only becomes power once you take action. Things will only change if you begin to do things differently. Your son or your daughter probably haven't responsed to anything you've tried so far, but hopefully that will be about to change. At the end of the day though, whether you decide to purchase Help! My Child Is An Addict or not, I hope that you find the strength to get through these difficult times and that your child manages to face their demons and come out the other side a better person, having gone through the challenges of living a life of addiction. Never lose hope that that is possible. P.S."Help! My Child Is An Addict" has been designed in eBook format so no waiting in the mail to get your copy. 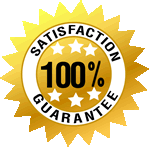 Within a couple of clicks of a button you could own and be reading your copy within minutes.